Pack your bags and get ready to go in a virtual romantic trip! 888casino offers you the chance to benefit from a great match bonus. Make a deposit of 20 Pounds or more every Thursday and use the code TravelThurs. 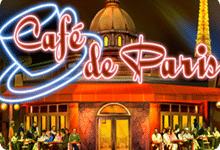 You will then receive a 20% match bonus up to 100 Pounds on Café de Paris and Viva L’Italia. In order to claim this bonus you have to wager your deposit money 3 times. Extra cash is only available for 14 days. Do you want to withdraw your winnings? You need to playthrough your money 30 times and then you can cashout. Double your chances of winning and get the taste of gambling with this great promotion!